After a productive summer of breeding bird studies and a brief break in July, on August 1st PIBO launched its thirteenth season of fall migration-monitoring studies at Fish Point Provincial Nature Reserve. Although it’s typically quiet this time of year – the real advance of migrant songbirds in Southwestern Ontario comes towards the end of the month – some species were on the move during the summary period including shorebirds and swallows, some flycatchers, orioles and swifts, and ones-and-twos of a few warbler species. At the same time, many local breeding birds have left the area by early August or are lying low in the heat (while completing their fall moults), and it can be remarkably still, especially since most birds are no longer singing. Their cryptic fall plumage and the dense, sunless forest add to the challenge of counting birds at Fish Point in early autumn. As such, the first census of the season was reasonably active, with twenty-nine species documented on the 90-minute walk. Although mostly local birds, there were also moderate numbers of migrant swallows heading south off the tip, along with a handful of waders, including Least Sandpipers and Sanderlings. A small group of Common Terns at the tip that morning grew to six-hundred individuals by mid-month. 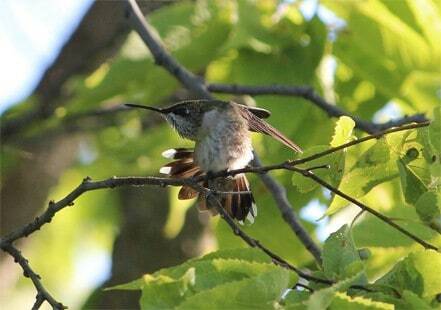 Once a common breeder, this species now uses the area primarily as a roosting site in August and early-September. Caspian Terns were also numerous during the first week of coverage – up to 35 birds – along with 40 Great Black-backed Gulls. The wind remained from the southwest on the 2nd – 3rd and species diversity dropped, although activity picked up on the 4th when 30 species were noted including 53 Cedar Waxwings, 12 Yellow Warblers, and 9 Baltimore Orioles. On an encouraging note, 15 Monarch butterflies were recorded on the morning walk. PIBO will record butterfly migration at the point over the next 75 consecutive days. A Northern Waterthrush on the 6th was new for the fall and one of the first passage migrants of the season. Passage migrants are species that pass through the island chain on migration but don’t nest in the area. The winds shifted briefly to the north on August 7th, which produced another small push of birds including the season’s first Least Flycatcher, American Redstart, and Black-and-white Warblers. There wasn’t much to report on the 9th – 10th apart from another Black-and-white and the usual stream of migrating swallows – predominantly Purple Martins, Barn, and Bank Swallows. A Semipalmated Plover on the 11th was a first for the fall on an otherwise low-key morning. August 12th was active by comparison, with ones-and-twos of four warbler species tallied, along with 8 Blue-gray Gnatcatchers, both cuckoo species, and a nice variety of others – 35 species in all.Hot, humid weather and southerly winds returned after the 12th and migrants were noticeably absent during the final three days of coverage, although there were lots of birds on the lake including 1300 cormorants, up to 1000 gulls of four species (mostly Ring-billed), 600 Common, and 35 Caspian Terns. PIBO’s next migration summary will be posted on September 3rd.